Riscus - "Difficulty to avoid in the sea." The ancient Greeks had a word for it, ριζα, which made its way to the Latin, Riscus. The original meaning was a metaphor for “difficulty to avoid in the sea.” Ancient mariners traveling along the islands that dot the Mediterranean, the Aegean and the Tyrrhenian Seas knew all too well what it meant. Over time, the word made its way to Italian – risico, rischo, and rischio; to French – risque, and to Spanish – riesgo. Starting in the 16th century, middle-high-German adopted the term Rysigo in a business sense: “to dare, to undertake, to hope for economic success.” This weekend, we witnessed an ironic collision of these two uses of the word: a €450M ship ran aground and ‘mostly’ sank – of all places – off the very coast where the ancients learned what ‘riscus’ is all about. I adopted the cover of Peter Bernstein’s excellent book Against the Gods as the primary image for this blog because of this intertwined history: risk management and humanity’s attempt to conquer the seas is intricately intertwined and is rife with lessons about how to go about improving our odds of success. It’s also a great story. It wasn’t until the Renaissance that we started quantifying risk and making any use of mathematics to help mitigate it. Early on, when the Ancient Greeks and Romans sailed the Tyrrhenian, they assumed that the uncertainty of survival on the seas was caused by the whims of gods like Zeus and Poseidon. That argument – that gods cause something – has a modern counterpart: “the computer told me so.” Both are black-box solutions to the problem that conveniently avoid the need for any real understanding. Both employ a very unsatisfying ‘Deus ex Machina’ to overcome the problem. Peter Bernstein made this point in Against the Gods with an analogy between the Oracle at Delphi and the modern computer: people believe the output of each because of its established authority, suggesting that trusting modern computers is as dangerous as trusting the Oracle’s advice. I wrote to Peter objecting to this line of reasoning because modern computers have verifiable benefit, while the Oracle at Delphi was just one in a long line of superstitious beliefs that have distracted people with comfort over reality. He didn’t budge: about as many people today, he told me in the late 1990’s, understand the output of computer risk models as back then understood that the Oracle was nonsense. For everyone else – the severe majority of people – they are dangerously equivalent. But such is the course of progress. Today’s airline passengers need not understand the Bernoulli principle to take advantage of international flight. Today’s medical patients need know nothing of molecular biology to benefit from their daily prescriptions. Similarly, today’s investor should not need worry about Martingales or Lévy distributions to avoid catastrophic losses in their portfolios. But we’re not quite there yet. We’ve gotten past the belief in gods, but as I’ve said many times in this blog, we haven’t yet found the underlying dynamics that would allow us to declare a fundamental understanding of these investment waters we keep trying to sail. The story of risk – of humanity’s struggle against the gods – is, as Pater wrote, remarkable. 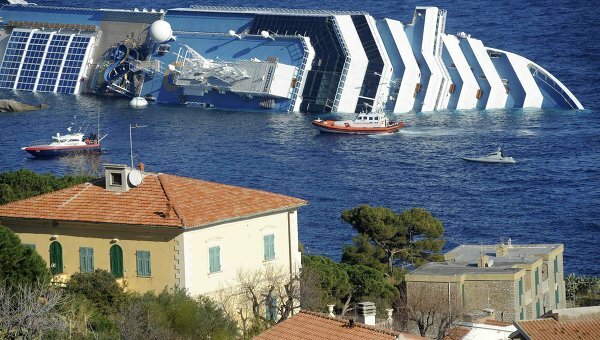 The Costa Concordia accident is a vivid reminder that even with the most modern equipment and procedures, risk is very much with us, even in the same waters where the word originated. Last night three newsworthy events took place, any one of which could make for an interesting blog entry about risk management: President Obama unveiled another attempt to reverse the economic slump, a credible (but uncorroborated) threat against NYC and Washington DC near the 10th anniversary of 9/11 was announced, and California, Arizona and Mexico had a massive blackout. It’s this last event that inspired this blog entry. At a Santa Fe Institute presentation last year, I got to hear Duncan Watts (Yahoo!’s Chief Scientist) talk about risk management at the micro-level (think individual fund) and at the macro-level (think the entire economy). Duncan Watts is a researcher and author on the topic of networks and complexity dynamics, with titles like “Everything is Obvious: *Once You Know the Answer” and “Six Degrees: The Science of a Connected Age.” The topic of the presentation, though, was about how, in the right kinds of networks, the process of reducing local risk can in fact increase global risk. I’m often asked for my “top 10” risk measures, and it happened again just the other day. The trouble is that a top 10 list is often interpreted as “No. 10 does matter all that much” and “I really only care about No. 1.” We love top 10 lists because they provide a linear answer, and our brains love to think linearly. We really like it when someone tells us what the single most important answer is to whatever we’re trying to solve. One of the tenets of this blog is that risk analysis, market behavior and economics are not linear systems and that thinking about them linearly is inappropriate and dangerous. Note: this posting originally appeared in IPE (Investment & Pensions Europe) on January 4, 2010. This version differs only in that I converted spellings to standard American English.